In recent years, refrigerated egg substitute has replaced the raw egg traditional to this classic salad recipe. Don't skimp on the garlic and herb croutons--they're well worth the effort. 1 of 1 Cook garlic in small pot boiling water, 5 minutes. Drain. Place garlic in processor or blender. Add egg replacement, anchovies if desired, mustard, Parmesan and lemon juice. Puree 1 minute. With machine running, add oil in stream until blended. 1 of 1 Heat oil and butter in large nonstick skillet over medium-low heat. Add garlic; cook 2 minutes. Add bread cubes. Increase heat to medium-high; cook, stirring frequently, until bread is evenly browned, 7 to 8 minutes. Stir in parsley and Parmesan; toss to coat. 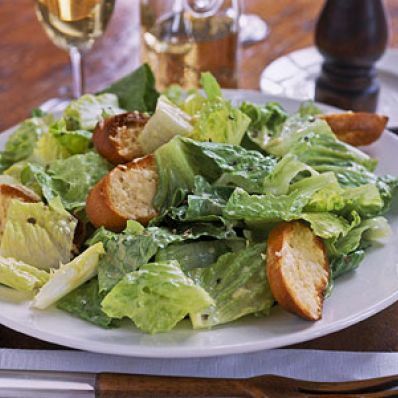 1 of 1 Toss together dressing, romaine and croutons in large bowl. Divide equally among 4 plates. Per Serving: 10 g carb., 26 g Fat, total, 8 mg chol., 5 g sat. fat, 292 kcal cal., 1 g fiber, 176 mg sodium, 5 g pro.